"We are defining a new mainstream,” reggaeton artist J Balvin told NBC News about his newest album, all in Spanish. Colombian reggaeton artist J Balvin has accomplished the unthinkable in the Latin music industry: a successful crossover into the American mainstream music market with albums entirely in Spanish. With his new album "Vibras," Spanish for vibes, he hopes to keep the momentum going and redefine the role of Spanish-language music worldwide. “It’s all about the vibes,” he told NBC News. “That’s why it’s called ‘Vibras,’ in Spanish. It’s an album that we made with so much love — proving and showing the world that Spanish is becoming the new." "We are defining a new mainstream," said Balvin. For many years, Latin artists such as Ricky Martin, Enrique Iglesias and Shakira achieved crossover success by recording English-language albums. Back then, the results exceeded everyone’s expectations. But with 4 albums under his belt and a 5th one being released on Friday, all in Spanish, Balvin is reinventing the way Latin music artists cross over to the U.S. music scene. José Álvaro Osorio Balvin, also known as J Balvin, was born and raised in Medellín, Colombia. With dreams of becoming a rapper, 17-year-old Balvin sought out Colombia's then-underground hip-hop and reggaeton scene. After several MySpace music campaigns and local performances, Balvin was signed in to the Universal recording label in 2013. At 33, the two-time Latin Grammy Award winner is one of the top artists of the moment. He is one of Spotify’s top 3 artists in monthly listeners worldwide. Just last month, he scored a Top 10 hit alongside rapper Cardi B and Latin-trap pioneer Bad Bunny with their boogaloo kitsch song "I Like It." Balvin’s previous music collaborations range from world-renowned stars like Jennifer Lopez and Justin Bieber to Pharrell Williams, Pitbull, Nicky Jam and Liam Payne, just to name a few. His new album includes collaborations with Puerto Rican legendary reggaeton duos such as Wisin & Yandel and Zion & Lennox, as well as artists such as French DJ Willy William, Brazilian pop star Anitta, Mexican indie-pop musician Carla Morrison, flamenco singer Rosalía and Aruban singer Jeon. The combination of diverse music sounds, from Zion & Lennox’s romantic reggaeton styles to Anitta and Jeon’s dancehall rhythms, shows what Balvin called “una evolución,” Spanish for an evolution. Balvin is the first reggaeton artist to perform on the main stage at Coachella, appearing alongside Beyoncé and Cardi B. His first ‘Vibras’ album single, ‘Mi Gente,’ which dropped last summer, took over the mainstream music scene by storm. For three months straight, ‘Mi Gente’ topped the Billboard Hot Latin Songs chart and surpassed 1.8 billion YouTube views. Even primetime TV shows such as Shonda Rhimes’ ‘How To Get Away With Murder?’ featured the song in some episodes. Blue Ivy, the 6-year-old daughter of legendary singers Jay-Z and Beyoncé, reportedly loved listening to ‘Mi Gente,’ which motivated Beyoncé to jump into the song’s remix, according to Balvin. The song hit the third spot on the Hot 100 list after such remix. In April, Telemundo Deportes named J Balvin and Michael Brun’s single ‘Positivo’ as the official pop song for the network’s coverage of the 2018 FIFA World Cup in Russia, which kicks of on June 14th. 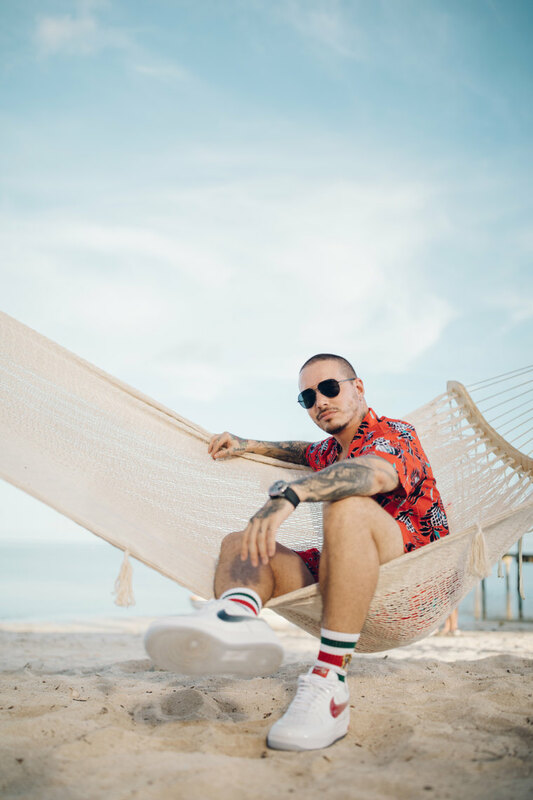 More positive vibes is what J Balvin hopes to give fans during with ‘Vibras’ world tour that starts in Mexico this May and makes it to the United States in September.